KOTA University of Agriculture and Technology has organized the Rajasthan Joint Entrance Test (JET) examination on 12th May for all aspirants applied for the test. A huge number of candidates seeking admission in B.Tech/B.Sc courses have competed for the Rajasthan JET examination. The admission will be given for the aspirants purely on merit basis. Candidates clearing this examination with good merit will get admission in the KOTA University of Agriculture. The MPUAT has released the Rajasthan JET answer keys soon after the examination completed. Aspirants competed for the Rajasthan JET examination have compared with the answers given in the answer key and estimated the probable score in the examination. All the hopefuls waiting for the Rajasthan JET result can shortly download Rajasthan JET result from the official website, jetcoakota.com. Candidates can go through the following article for more information. Maharana Pratap University of Agriculture and Technology annually conducts the Joint Entrance Test (JET) examination to affirm the admission into various Graduate degree courses based on the merit of the aspirants. Candidates clearing the Rajasthan JET with good merit will get the admission in various courses such as B.Tech (Food Technology/Dairy Technology), B.Sc. Horticulture (Honours), B.Sc. Agriculture (Honours), B.Sc. Forestry (Honours), etc. Candidates will get admission in MPUAT and its affiliated colleges. Candidates have to clear the Rajasthan JET with a good score to get the admission. The Maharana Pratap University is going to release the JET results on 28th may. Aspirants can download Rajasthan JET Cutoff marks at the same time. The cutoff marks will be announced by the based on the number of seats available, the number of competitors clashed for the exam and other factors. Candidates those who get the good merit in the examination will get admission in MPUAT agriculture degree courses. Candidates qualified in the examination will have to attend the Rajasthan JET Counselling process, which is going to be conducted from 28th may onwards. Candidates have to pay the requisite processing fee to attend the counselling. The qualified aspirants have to carry all the required documents to proceed with the counselling. The MPUAT is going to affirm the admission in the various course for the merit candidates based on their rank and score obtained in the examination. 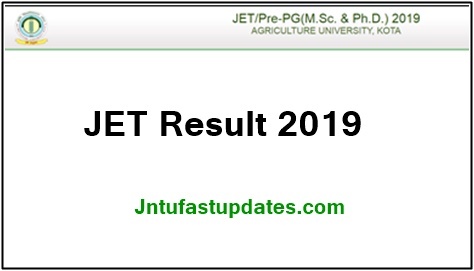 On the homepage, JET result 2019 link will appear on the screen. The Rajasthan JET result, scorecard, rank appears on the screen.